Eight years ago today, our oldest child, Hannah Marie, was baptized into the name of the Triune God. I noticed, as I was going through a few things, that both of us were given the same style of baptism certificate (see photo). It’s actually quite remarkable that almost identical certificates were available for 25 years with hardly any changes. I’m not sure if they are still available today. I didn’t see them at either NPH or CPH. I like the fact that Hannah and I have the same certificate, but I’m not sure I would have chosen these. As a pastor, I have tried several options for baptismal certificates for children baptized in our congregation. I have tried a few different styles of purchased certificates. I have also, more recently, created my own certificates. I have also felt that it was nice to have a certificate that could be framed to hang on the child’s wall. The certificate that Hannah and I have is part of little booklet, which is not meant for framing. The other thing is that the certificate should be well designed, and have an official look to it. It should look like something meant to be displayed. Many of the certificates available for sale are okay, but were never quite what I was looking for. The certificates I made were okay, and I thought they looked fairly nice, but there was something missing. There are other places where you can find vintage baptism certificates, as well as other kinds of certificates (CPH and Agnus Dei Printing). But I have chosen to give these a try, as the best combination of a classic look, modern convenience, and reasonable cost. 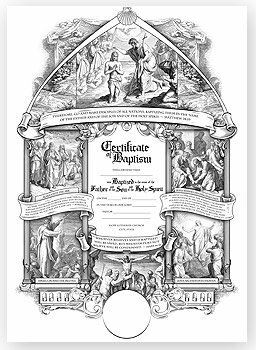 If you’re looking for baptismal certificates for your church, give these a try. Either way, try looking for your own baptism certificate. See if it’s something you can put in a frame and place it somewhere where you can be daily reminded of the life-giving water by which God poured on you the forgiveness of sins and all the benefits of his cross. I just sent you an email with another option. The wolfsoncreative one is very nice though. With our little due to enter this world in the next month, I hope we can make use of a certificate like that. We’ve been looking for ways to continue reminding our children about their Baptism. Lisa has made shadow boxes for both Addie and Matthias with small copies of their certificate, their baptismal candle, their baptismal napkin and pictures of them with their sponsors. It’s also fun to make a big deal out of Baptism when we have one at Cross of Christ. These beautiful certificates will, I think, help us to continue doing that as the Lord welcomes sons and daughters into his family through Holy Baptism. Thanks again and God be with and bless you as you prepare for another Lenten journey to the cross and empty tomb! Yes, these classic certificates are what I got for my little ones. I used Agnus Dei Printing and they have great products. I like what I’ve seen on Pr. Wolfmueller site also. Cheers for timeless reminders of our holy washing!